Very much the Dark Souls of Tic Tac Toe. I have been playing a lot of Tix.Tax on the sly recently. It's a browser based take multiplayer game that elevates the humble game of Tic Tac Toe to a new level. It's the sort of game you might see played in a Star Trek episode next to five-dimensional Chess or inside-out Go. In Tix.Tax you play ten games of Tic Tac Toe at the same time. Each sector in the large 3x3 Tic Tac Toe grid is itself a tiny game of Tic Tac Toe. Once you win a little game, you take that space in the large overall game. You win the entire game if you take three little games in a row, as the laws of Tic Tac Toe demand. When you take a space in one of the tiny grids, play shifts to that sector for your opponent's turn. 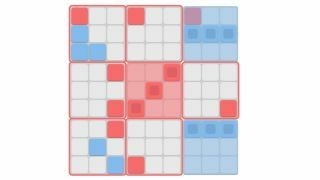 If I take the top-left space in the central game, my opponent then gets to take a space in the top-left game. It's probably easier to show it. The result is a tactical game of territory management in which you try to force your opponent to play in little games that are useless to them, so that they hopefully have to give you the move you want. Tix.Tax gets complicated pretty quickly. Importantly, if you take a space that would move play to a little game that someone has already won, your opponent gets to play in any available space they like. In the clip below I know that blue needs the bottom-right space in the bottom-right mini-game to take that zone. By taking that space he claims that game. As play should then move to the bottom-right game he just claimed, I actually get to play anywhere I want. So I use my next move to win. Yay! Yep, it's quite mind-bending, but I like it a lot. The game is free and lets you face off against people, or a bot for practice. Fun fact: one of the creators is Jesper the End, one of the brains behind classic Minecraft adventure maps like Diversity.